Whilst involved in producing a successful Parish map in 1993 it was clear to me that Croxley Green had a wealth of history that residents were keen to share their photographs and documents as well as personal memories. Encouraged by an elderly neighbour Harry Packman,(since passed away) I began collecting these. I visited dozens of residents recording their childhood reminiscences (written by hand then). Many wrote and sent them to me. Photographs loaned or given were copied and a collection began. I looked for a comprehensive history of Croxley Green and found written articles in The Resident, in booklets produced by The Rickmansworth Historical Society and others. Picture books with photographs of Croxley Green appeared in locally produced editions with brief descriptions. It seemed to me Croxley Green merited a collective history of its own as I was discovering remarkable and unusual memorabilia for a small village. 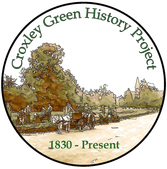 As early as 1900 Croxley Green was a community where residents became involved and strived for the very best for their village. This was encouraged by John Dickinson (paper mill) providing his workers with exceptional facilities and allowing these amenities to be shared with the whole community. Wealthy land owners and influential residents also contributed to the village way of life. School teachers endeavoured to provide their pupils with a first-class education along with extraordinary opportunities, most often with limited resources. An increase in house building in the 1930's saw acres of Croxley Green's farmland quickly filled with estates and became part of the Metroland. This new community soon became united and coordinated to put on the most astonishing celebrations in 1935/ 1937 for King George V Jubilee celebration and King George VI Coronation celebration. Filling in the history gaps I found so much of the village history/archive was scattered throughout the county even at the National Archives at Kew, London. Collating this into a workable and useful archive that could be used as a resource for groups, individuals and educational purposes would enable others to easily add to it. The future of a community is made up of its past and how residents can use this to preserve and conserve the best for the next generations. 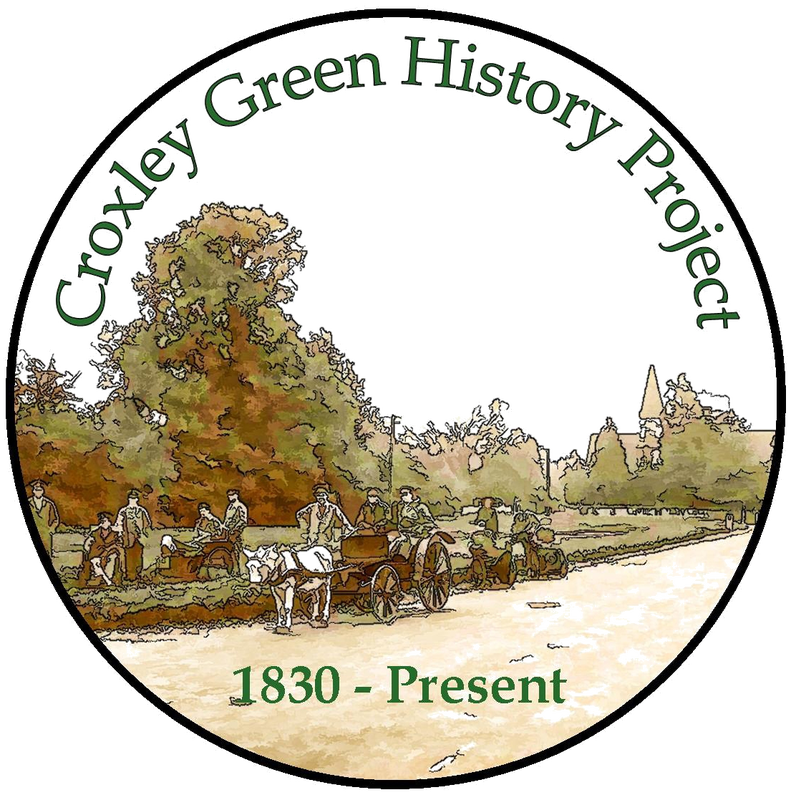 For the past two years the CGRA has encourage us as a small team, working together on this 'History Website Project' for Croxley Green. A huge amount has already been uploaded and more to follow. As the project is gaining momentum, generous offers of more material is being offered. My sincere thanks..... to Don Carless who read my 'first efforts' and encouraged the remainder, to David Pomfret who spent many hours helping to make the photographs more professionally presentable for the website. This task requires many hours of patience as I found out attempting to improve more recent contributions. In addition the support from the Croxley Green Residents Association giving an enormous amount of committee time and enthusiasm to the project seeing this stage come to fruition. Along with Lynn Withington and Julia Matheson, chairman, Barry Grant , vice chairman, Tony Munroe have been so supportive. It is Ross Humphries who has taken the project material, persevered, and created the user friendly website for current residents and those further afield. For both young and old residents who may want to look back on the place in which they have fond memories. I first came to Croxley in 1942, and after a brief spell in Repton Way, my mother and I moved into Yorke Road, where I have lived ever since. As you can imagine, I have seen many changes over the years: the blacksmith in New Road has become a garage; shops have come and gone. I started school at Yorke Road Infants in 1943 and went to Watford Grammar School for Girls at the age of 6 and 9 months as one of the last intake of primary school children. I have always been interested in history, and when the campaign began some years ago to save Yorke Road School from destruction, I became involved in the research that we undertook to present a case for its listing. Visits to archives in St. Albans, Kew and Lambeth Palace enabled me to establish its history – with the maddening gap of the name of its architect. I have since spoken on its history to U3A groups in Croxley and in Rickmansworth, and to the Friends of Rickmansworth Museum. I am very proud to have played a very small part in the setting up of this website by helping with the proofreading. Croxley Green has a much richer history than one might have been aware of and I am now inspired to continue researching it. I hope that many other people will feel the same and help to build the site into something even more special. Enormous thanks to Margaret Pomfret and Ross Humphries for all the work they have done so far. I first became involved with this project in July 2013 when Margaret Pomfret agreed to visit Rickmansworth School as part of a local history day. Her years of research and wealth of knowledge quickly became apparent and I was delighted to lend a hand with some of the initial proof reading and transcribing. The site will be invaluable as a resource for local schools and we hope that the pupils and their families will use it to discover more about the area in which they live. For Croxley Green is full of surprises and is so much more than just another stop on the tube. History comes alive for our pupils as they walk around the village uncovering the plaques on the trees on the Green and noticing the dates on the houses in New Road. The website will help them to picture life here long before mobile phones and the Internet, to connect with the residents named on the census, to look around them and understand how the area has developed and to appreciate the community spirit which has drawn people here and which makes it difficult for them to leave. It is the people themselves who have shaped the history of the village and continue to do so today. The website is already a mine of fascinating information, photos and memoirs, but I hope that it will continue to evolve as local residents of all ages not only use it but also take ownership of it and add their own experiences of life in Croxley Green. When I was elected Chairman of the Residents' Association about 6 years ago, committee member, Rose Hanscomb, suggested that I contact Margaret Pomfret about the possibility of doing a coffee table book on Croxley Green's history based around the plethora of information gathered by Margaret for a book that never materialised (that's a story for another day!). But why limit things to a one off publication? One thing led to another and Ross Humphries came on-board. With his vision and technical know how Ross steered us toward the creation of a website, something that we could start and which would grow and grow as a living history of Croxley Green. I am absolutely delighted with the way in which the website has turned out and amazed by the quality of its content. Margaret and Ross have, through hard graft, dogged determination and no little skill produced an inspirational piece of work and made it easy for others to present their own slices of local history to a worldwide audience. This is not the end of the beginning but the start of something very special. I first became involved in the history project through my membership of the Residents’ committee. Margaret Pomfret brought to the committee’s attention the importance of documenting Croxley’s rich past and to provide the means for the public to have easy access to all the archive material she had collated over many years. With Margaret’s extensive knowledge and enthusiasm we decide to build this history website and started a Croxley history group to oversee the project which would also provide the means for project to continue once the website went live. We do need to pass on our gratitude to Margaret for all the hard work and dedication she has given to the project and we are lucky to have someone who can give answers to the many questions about Croxley Green’s varied and rich past.